Oracle Metadata Services Repository (MDS) is used for asset centralization patterns .It removes duplication across projects and clustered environment and simplifies maintenance in case of future changes. This blog looks at how the B2B document definitions can be used across B2B and Composite in SOA Suite 11g using oracle MDS. Create a database connection to MDS store. Next step is to go for the B2B adapter configuration. Drag and drop B2B adapter on to Exposed Services swim lane of the composite. 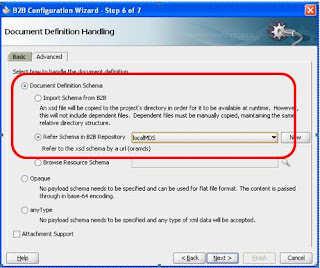 Enter the environment specific values in the B2B configuration Wizard Step 1-6. In step 6 Use the Advanced option. 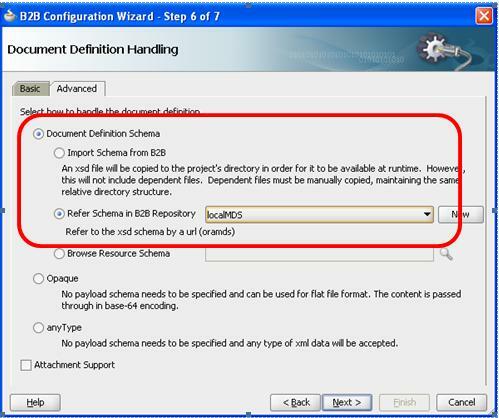 Select the Refer Schema in B2B Repository option and point to the MDS store. Select the trading partner specific document definition. What about the schema location? Since we are referring to the XSD in B2B schemas in MDS store, it will not create a local copy in the project. The schema location in wsdl will be referring to the MDS store. The location will be referring to the same location where we added the XSDs in B2B.